The iBreeze Air and Solar team consists of over 50 years combined experience in the industry! 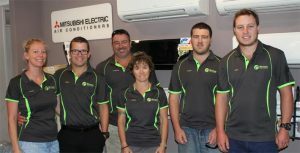 Including owners Lance and Cassie, installer dream team Laurence and Karen, and our electrician Mick, our team is second to none when it comes to commercial and residential heating, solar power, air conditioning in Mandurah and The Peel Region. conditioning products and are experts in installing a variety of units including ducted cassette, ducted evaporative, multi head, and refrigerated air conditioning Mandurah. iBreeze Air and Solar are hugely passionate about renewable energy and provide a range of highly energy efficient solar power and wood heating solutions for your Mandurah home, which will not only protect our environment but also lower your power bills significantly. Not only can iBreeze Air and Solar install brand name air conditioning units such as Mitsubishi Electric, LG, Carrier or Samsung to high standard but we’ll also service them too, even if they weren’t installed by us. Our air conditioning experts, through years of experience, located faults and are able to repair the unit quickly, properly and cost effectively. At iBreeze Air and Solar we always look to provide the best solution possible and try to fix the problem first to try to give you the best value service, we’ll never see an air conditioning repairs job as an opportunity to sell you a new unit, control panel or ducting system if you don’t actually need it. From residential to commercial jobs, there’s nothing too big or too small for our team of dedicated and highly experienced heating and cooling experts. And if you don’t know what type of air conditioners you should be installing on your premises, we’re able to advise you on the best solution that will guarantee performance and consume the minimal amount of energy to fulfil your needs. Don’t swelter through another Summer! For all of your Mandurah air conditioning needs, get in touch with the local experts. With highly competitive prices and interest free finance options available, there’s no reason not to get an obligation free quote from iBreeze Air and Solar today! iBreeze is a family owned Mandurah based air conditioning, heating and solar power company servicing the Peel region of Western Australia. We help customers find the perfect air cooling and heating solutions for their individual needs and budget. When contacting iBreeze Air and Solar you won’t be met with pushy sales reps or sub par customer service, our owner Lance will most likely be your first point of contact and he will ensure your needs are taken care of. Our teams extraordinary knowledge of range of solar, air conditioning, and wood heating brands is unparalleled and ensures your chosen product will satisfy your needs. With access to the biggest brands in air conditioning and solar panels, iBreeze Air and Solar can now provide warehouse prices to the general public in Mandurah and the Peel region. So whether you are renovating, building or just looking for an alternative power, cooling, or heating solution for your home, iBreeze Air and Solar will be able to help you design and select the best product for you. We know that more and more households in Mandurah and the Peel region are doing it tough in this economy but no one wants to suffer through our hot Australian Summers without adequate air conditioning throughout their home or to shiver through our Winters without any form of heating. That’s why iBreeze Air and Solar offers interest free finance across the range of air conditioning, solar and wood heating products, allowing you to buy now whist paying for it in small instalments over time – interest free*. Never has there been a better time to invest in your cooling and heating to upgrade your comfort at home as well as its market value. At iBreeze Air and Solar, we’ve got your back and will make sure that you’re paying for quality air conditioning, solar panels or wood heaters. We never stock cheaper products that will eventually require heavier maintenance costs just to make a sale. That’s the benefit of dealing with a small, independent and family owned heating and cooling business that relies on reputation. Take the eligibility test and apply online. 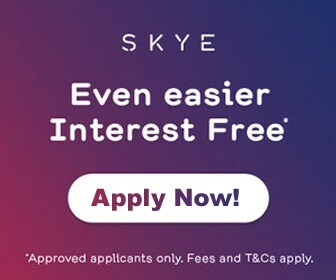 By applying for finance through us, you’re not committed to anything – you’re simply just finding out if you have the ability to access this finance offer. Apply online in minutes – simply click the button to the right. Enter your information online and receive the decision via email within seconds. If approved, you will receive an approval notification email. Contact us to discuss the next steps. Please ensure you keep your “Welcome Confirmation” email, as you will need this and a form of identification e.g. your current driver’s licence, to complete your purchase.